The other day, my coworkers came into my office. “Paul, look what we caught! Have you ever seen a Pokemon like this? 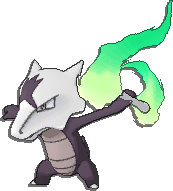 It’s a marowak. But on fire!” I’ve seen this before, it wasn’t that exciting to me. I put it out of my mind and moved on with my life. Now the game is Pokemon GO! In it, you catch Pokemon and you can battle in raids, which allow you to capture rare Pokemon. The Alolan marowak was one such rare Pokemon. Obviously I’d love to get my hands on a sweet ghost type, but life is what it is and I only have so much time. I went to my parents’ house to get lunch, since it’s only five minutes from the office. When I was eating, there was a text in a FaceBook chat for my city. “Raid. Ends in 16 minutes.” It was Alolan marowak. I was about ten minutes away. “Wait 10 minutes. On my way.” I text quite properly. I got in my car and took off, racing to the park where I could capture this creature! As I drove, perhaps a little faster than usual, I thought this is how Ash feels. When he takes off to somewhere exciting he gets this pit in his stomach, this knot of excitement that vibrates within his soul. Because that’s what I was getting. I felt like a kid. At the park there were a bunch of kids. I was wearing a nice shirt and my new skinny tie (I’m trying a new look, and I’m sure that’ll become a new post). “Going in,” someone messaged. Once you start a raid, anyone else has two minutes to join in the fun and games. I ran, as the parking lot was a good way from the barn. It was hot and humid out, just short of 90, and I was running in my work outfit. The kids there saw me running, and some of them caught the bug, though they didn’t know what it was. They ran. “Don’t run,” I heard shouted from one of the volunteers watching after the kids. “But he’s running!” they retorted. “You’re not my supervisor!” I didn’t actually say it. I’m chunky and this running thing was killing me. Who has the energy to talk? I arrived with a minute left on the timer. We jumped in and absolutely crushed the poor marowak. I felt bad for him. Then again, the Pokemon’s history is that as a cubone he lost his mother and wore her skull. So we should all just feel really bad for marowak. I met JimmyJam and CyberGrandma and we talked away the rest of my lunch break. I’d met CyberGrandma before. She’s pretty awesome. Then, sweaty, I went back to work. The energy was incredible. It wasn’t that I caught a marowak. It was that I raced for it. That I met other trainers doing it. That for a brief time I felt like a small child, giddy for the adventure which awaited. Do you play Pokemon GO!? What is your favorite story?